Curious about what happens when a philosopher makes films? I suspect that some may already be familiar with the result as Spanish director Ãlex de la Iglesia has made a number of acclaimed films but this is my first brush with the Spaniard. After all, when a film is described as a parody of the Spanish Civil war with clowns, how could I overlook it? 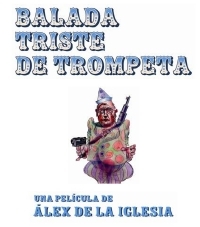 The Last Circus (Balada Triste de Trompeta) is described as a wild and hilarious film that exposes the nature of political conflicts in his countryâ€™s recent history. Set in a circus, the film offers a pointed metaphor for the Spanish Civil War and the years of Francoâ€™s dictatorship. It sounds like it should be a serious story full of big ideas and poignant observations and though I donâ€™t doubt the latter, de la Iglesia is a man who knows that comedy is a good way to expand audience and what we have is the big ideas told in the microcosm of two clowns fighting and disfiguring each other over the love of the same woman. No official trailer yet but I had to see what this looked like and in my search I stumbled on a few things. In addition to the images provided by TIFF, thereâ€™s a gallery with a handful of additional images after the break, along with a video interview with de la Iglesia (in Spanish), in which he speaks of the production. The bonus here is that the video also gives us a first look at footage from the film. Can. Not. Wait. Full trailer on the way soon (I hope) but for now, check out the images and video after the break. Pure awesomeness. Glad to see Iglesia has recovered from the English language dud that was The Oxford Murders. Can't wait.